Don’t miss out on amazing Hama Bead packs and designs this Easter! This Easter, the kids will be off for 2 weeks, which will seem like a life time if you don’t keep them busy. We found over other holiday periods that Hama Beads offers a great life line and will keep kids happy for hours – so don’t miss out on some of our amazing Easter Hama Bead designs or your chance to buy Easter Peg Boards and Packs. Buy the Easter Starter pack right now from Amazon for less than £10 (as pictured above). This fabulous new kit contains 2000 mixed midi beads, 1 new egg shaped board, 1 mobile ring, 2 stands, thread, designs, instructions and ironing paper for a gorgeous spring time mobile. Buy the 3D Chick pack right now from Amazon for less than £10. This fabulous new kit will allow you to create your very own 3D chicken from a pack containing: 3000 mixed midi beads, 1 large round shaped board, Satin ribbons, designs, instructions and ironing paper for a gorgeous spring time mobile. Click the links above to buy the official Hama Bead spring time pegboards. As always, please keep coming back to our Hama Bead Facebook page and share with us anything you create! We may even add it to the site too and make you famous! Who believes in the Easter Bunny? Well you don’t need to really, this is a Bunny Rabbit design for all seasons. We chose to create it in grey, just like Tibby who sadly passed away. Why not be adventurous and try different colours. 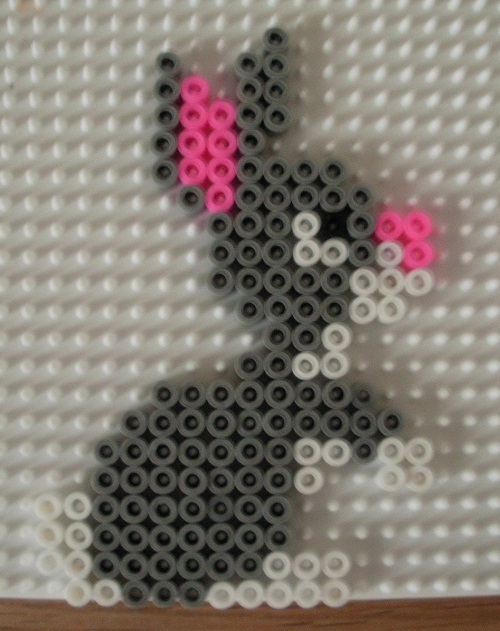 What you require to make a Bunny Rabbit out of Hama Beads. Colours required – Here is a list of the colours you will require to make this Grey Bunny Rabbit and the part number of the individual coloured packs. A beautiful little chick enters the world! Here is another beautiful Chick, this time using a small circular hama peg board and looks as though it’s just hatched from an egg. We hope you enjoy creating this for Easter too. 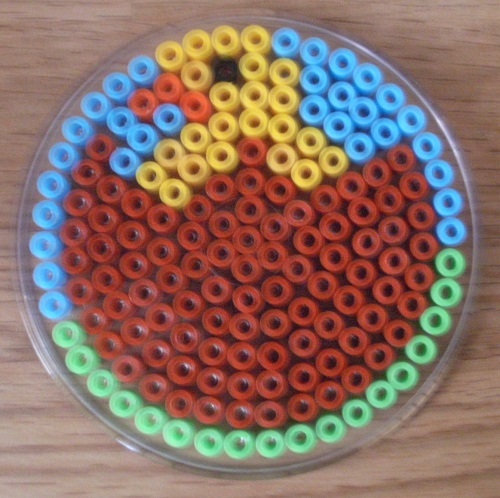 What you require to make Hatching Chick out of Hama Beads. Colours required – Here is a list of the colours you will require to make this Hatching Chick and the part number of the individual coloured packs. Celebrate Easter with the Easter Bunny! We hope you enjoy creating this for Easter. 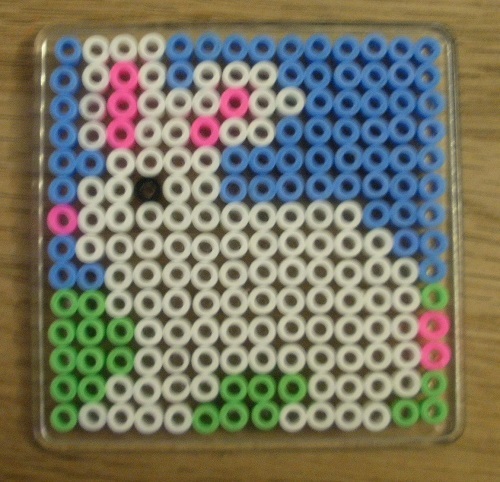 What you require to make Small Square Easter Bunny out of Hama Beads. Colours required – Here is a list of the colours you will require to make this Small Bunny and the part number of the individual coloured packs. Celebrate Easter with a Beautiful Chick! Easter just wouldn’t be the same without a “Chick”. After seeing them hatch at my daughter’s school this week, I just had to add a pattern to the site. 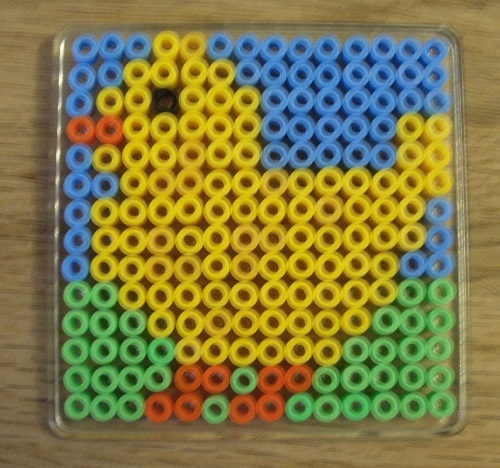 What you require to make Small Square Easter Chick out of Hama Beads. Colours required – Here is a list of the colours you will require to make this Small Chick and the part number of the individual coloured packs.